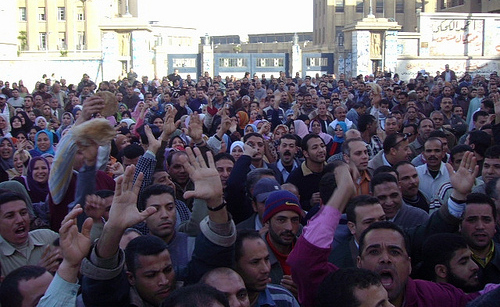 Egypt, Chaos, The Muslim Brotherhood, a land poised for Theocracy?? I'm not a foreign diplomat. I'm not an expert on the region of Egypt. I'm an amateur when it comes to Islamic Analysis. I am simply a faith journeyman trying to understand the geo-political/religiosity that under-girths much of society around the world. Whether it's the Christians in American politics, or the Muslims of Iran; there's a faith component to be examined, and without careful understanding this thing can get ugly…for all of us. So with all that said…What's really going on? And I heard John Bolton try to explain "Reagan-esque" foreign policy today making comments like "America should be strong arming the middle east diplomats to steer clear of Saudi Arabia." I did a little research on the Muslim Brotherhood, and they don't seem nearly as extremist as Hannity or Beck would want you to think. But Anderson Cooper did take a couple of blows to the head this week as he tried to report on the ground amid angry protesters. So as I watch this dibacle on television, 10000 miles away…I'm wondering….anyone want to play into telling the readers here what's going down? I've been to the Middle East. I've eaten with Muslim families. I've talked Quran with Imams. I've also seen what dyer poverty does as it causes uprisings around the world. But Egypt seems to be different. Are there protesters interested in Freedom? Or is this just another extremist poly to mix up the bag of Middle East Politics? I know there are several State Department employees reading this blog. Come on…Chime in and help us understand. We know Muslim families are just like families here. Priorities of education, family values, and just making a living are at the top of the list. We know terrorism is a plague among the few. So let us in on the mix. How can a country with thousands of years of history be in such turmoil? Let me see if I can help answer your questions or at least illuminate the root causes of the protests in Egypt so as to shed light (or a better understanding) on the current situation. The Mubarek Regime is highly corrupt. There were a few winners and many losers once Mubarek privatized many aspects of the Egyptian economy. As a result, rent-seeking became a commonly accepted element in business transactions. To clarify, rent-seeking is a politically determined, discriminatory policy that favors a small minority to ensure political and social favor while economically undermining most people. Usually this takes place in the form of a “rent” whereby an individual or groups of individuals obtain income or capital through politically determined or set prices that are higher than international prices as opposed to producing wealth or facilitating economic transactions. As a result, there is no real gain and nothing of measurable value is added to the economy while numerable costs are inflicted on society as real income declines. Once rent-seeking becomes pervasive it greatly increases the proneness of a country to conflict because perpetuating rents is the logical conclusion for the select few that benefit from them. Eventually, the costs imposed on society become so great that redistributing and reallocating resources becomes the primary concern rather than emphasizing innovation, development, and progress. In essence, every gain is constrained by a loss, leading to a zero-sum game and ultimately, a negative-sum game when the losses far outstrip gains. In the case of Mubarek, a sort of collective action problem occurred when small, wealthy groups with very narrow interests started to work together to accrue special benefits and privileges at the cost of the public majority (or public at large). However, a problem emerges as the process to organize the public majority is either unprofitable or too costly (up until recent days), thereby enabling special interest groups to continue their pursuits of rent-seeking. This is because the cost for special interest groups is comparatively small whereas organizing large numbers of people would be costly as the majority of people would be forced to desist from income generation to protest or lobby against special interests. Taking full advantage of this paradox, special interest groups are intensively buoyantly lobby politicians and lawmakers for additional privileges and benefits–Mubarek and his cronies specifically. Tragically, the situation in Egypt is dire and I shy away from any prognostications. I just hope this provides some insight as to the ‘why’ and ‘rationale’ of the protesters (which on balance, seems justified).